The Far Future World has arrived to Plants vs Zombies v2! Plants vs Zombies 2 has just received a big new update and finally the expected Far Future world has been unlocked. 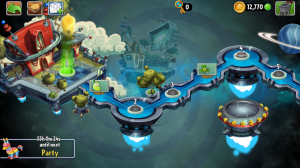 After the latest small updates that brought back Dr. Zomboos, now the company has activated the new world, with 24 new levels that bring new zombies and plants to the battlefield. Among the new plants we will see some known from the first edition, like the Star-Fruit, and some others completely original as the laser Bean. 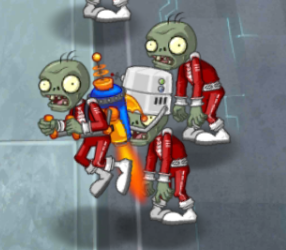 In total we will find 8 new plants, which will help us trying to stop the 10 new types of zombies that we will face, including for example one equipped with a jetpack. Other interesting new features are the energy tiles. These act as an enhancer power grid, so when fed a plant located in a tile of that network, all other plants connected will also be effected by the power-up. It’s also worth mentioning that the Zen garden has returned. So we can now grow plants and earn some rewards. If you think of all these new are not very impressive, there is still one more detail. 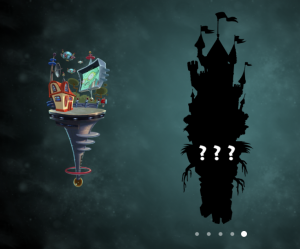 After spending months intrigued by the mysterious world of the future, now that it has finally been revealed the company leaves us with the same mystery showing the silhouette of a new world, this time with a medieval flavor. Plants vs Zombies 2 continues it freemiun form after this free update. The company already has more than 10 million of downloads only from the Play Store and it has received excellent reviews from its users. Much of the success is due to the excellent balance achieved between in-app purchases and the free game. You can complete the entire game without spending a single buck, but you can make purchases to get coins, plants or keys faster in case you do not want to invest much time in the game. Plants vs. Zombies is available for iOS and Android, and you can download it for free from the App Store and Google Play respectively.